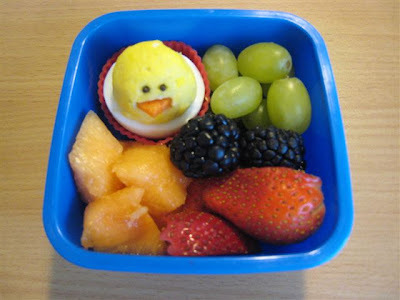 BentoLunch.net - What's for lunch at our house: Preschool Bento #37 - Cutest Easter Eggs Ever! Preschool Bento #37 - Cutest Easter Eggs Ever! So, F&B and I were boiling eggs this morning for Ben's snack when it occurred to me that we needed to do something cute with the eggs for Easter. We do the egg mold thing frequently enough that it's not new and exciting, so I started thinking how to make something else cute. They are basically deviled eggs, but cuter! I boiled the eggs as per usual, sliced across the middle and scooped out the yolks. I mixed the yolks with just a bit of mayo (need to talk to my SIL to find out how she makes her yummy deviled eggs) and scooped those back in with a melon baller. 1 carrot triangle for the nose and two dark brown jimmies/sprinkles for the eyes, and it's a chick! If we weren't rushing for Ben's school, I would have tried cucumber or raisins for the eyes, but I didn't have enough time to mess with them. Next time, I think I'm going to use the bottom eggs only as the holders as the top part (the egg on the right in the double picture) was a bit flimsy. F&B ate the spoils anyhow, so it's not like anything went to waste. Ben took his very cute chick egg to school today, along with canteloupe, strawberries, blackberries and grapes. Ah! Those are too much. So cute! They looked so cute!! I wanted to try making them later. I love the chickie eggs!!! What a wonderful idea. I've never seen that. 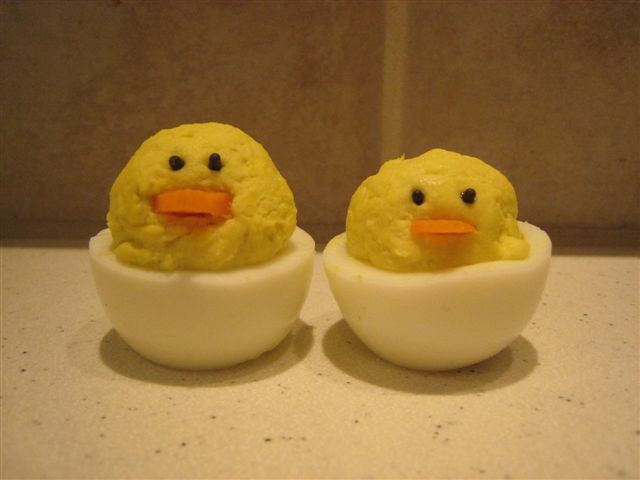 These are so cute, I am going to make them for Easter today!!! This is quite possibly the cutest thing I've ever seen! LOVE it! I would probably use sesame seeds for the eyes instead of candy sprinkles. 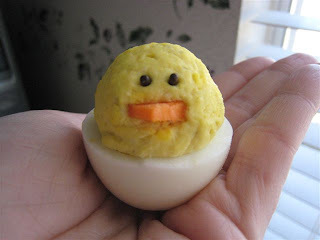 I couldn't help but include your cute chick eggs in my blog post "Sugar Free Easter Basket Ideas"! Pinned it too. Thanks for sharing!